While governors and Senators are important figures in the U.S. political system, it has always been a point of debate over who is more influential. Let’s go ahead and learn more about their roles and responsibilities to find out. 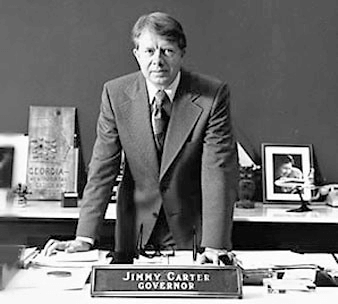 Jimmy Carter served as Senator and governor of Georgia before becoming the 39th U.S. president. A governor is a chief executive of a state. Each state elects its own governor, and the governor heads the state just as the president heads the whole country. Governors are not subject to federal authorities (unless otherwise stated by the federal constitution). As governors function as the head of government and head of state, they have the authority to implement state laws and manage its affairs. A governor may also have considerable control of his jurisdiction’s budget. He can appoint state officials and judges as well as participate in creating state laws. In states where the National Guard is not federalized, the governor acts as its commander-in-chief. This would also include the state’s defense force, such as the police. The governor can sometimes hold partial to absolute authority to pardon a criminal sentence. All U.S. governors are directly elected and serve four-year terms with the exception of Vermont and New Hampshire governors, who only serve 2 years in office. Governors have the power to veto state bills. In 43 states, the governor has the power to reject certain provisions of an appropriations bill without rejecting the whole bill, a power not even the president wields. A U.S. Senator is a member of the Senate, the counterpart of the House of Representatives in the United States Congress. There are two Senators elected for each state, who each serve for 6 years. The Senate performs many important duties and responsibilities including creating and passing laws. They have the authority to approve many presidential appointees and treaties with other countries. Part of their job is to oversee the performance of the president’s administration. Their main responsibility is to ensure that the interests of their respective states are represented in the nation’s political process. Senators can introduce new laws. They also hold the most power to deliberate, modify and block proposed laws (except revenue-related bills). Senators can elect the vice president of the country in the event of a tie in the state electoral votes. The Senate can preside over impeachment proceedings initiated in Congress. Now that the roles of each have been discussed, what’s the difference between a governor and a Senator? Does a governor hold more influence and power compared to a member of the Senate? A governor is the head of a state, while a Senator represents the interests of their state in the political process. A governor is in charge of running state affairs but has no direct control in national politics. A Senator, on the other hand, is tasked with passing laws dealing with their jurisdiction’s welfare and interest. While a governor possesses considerable control of his jurisdiction’s budget, a Senator cannot exercise its power over revenue-related laws. In some instances a governor has complete authority over the National Guard, while a Senator does not have any sort of authority over this matter. A governor can choose to block provisions in a state bill (line-item veto) while the Senate can block both federal and state legislation from being enacted. While both are elected into office, a governor serves for only 4 years while a Senator stays for 6 years in office. Only one governor and two Senators can be elected to represent each state, so the U.S. has 50 governors and 100 Senators at any given time.